So, I guess the news is officially out, at least to some degree. The news? We'll be releasing a shot timer that has the potential to shake up the timer industry. 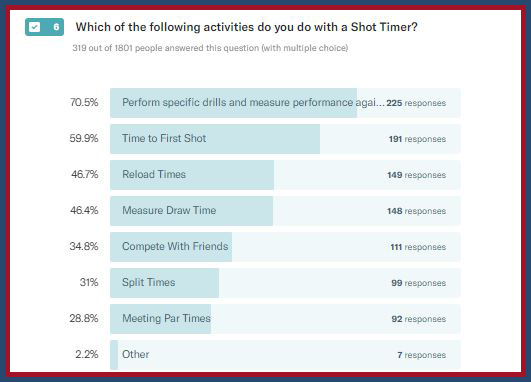 We recently had a survey put out to our audience to find out several different aspects about shot timer ownership, and be it far from us to leave our people in the dark. So, here are those results. Before we move on, let me explain something about the survey itself so there's no confusion. 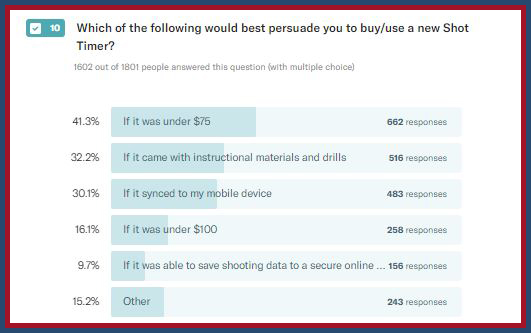 You'll see a different number of results on each question because the survey was interactive. What this means, is that your previous answer decided which question you'd get asked next. For example, if we asked you if you own a shot timer and you said no, your next question would be different than someone who said yes. Do you use a shot timer? 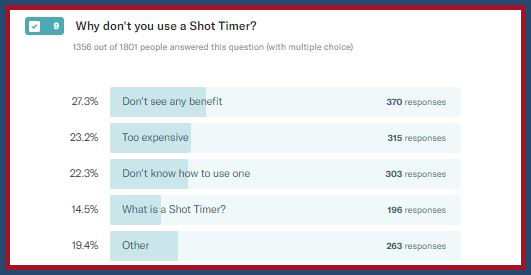 This first question shows us that most of you, not surprisingly, do not use a shot timer. There are varying reasons as to why this is, as we'll see below. But, the numbers are staggering. 82% of us don't use a shot timer. I'm included in that number, by the way, so don't feel guilty. Why don't you use one? This is where it starts to get really interesting, at least for me. As you can see there are several different reasons why people don't use a shot timer. For me, it's because they're too expensive. What we can't see here, is that under the “other” category those 19.4% or 263 answers were fill in the blank types of answers. This means that we couldn't quantify an answer to easily show you. They were too varied. The one I want to focus on, is that there isn't “any benefit.” There are many benefits to training with a shot timer. The issue, is that it's a moot point if you're at a restrictive range that won't allow you to use one in your live fire training. One of the main benefits is that you actually get to compete with yourself on the draw, shooting, drills, etc, and get better. When you get better at the range, you also inherently get better at self-defense. That's why we're all here, I hope. I mean, we carry concealed because we believe at some point there could be a threat that we need to use our gun to diffuse. This next one is very interesting. We asked people how often they shoot. The top answer is several times per year. 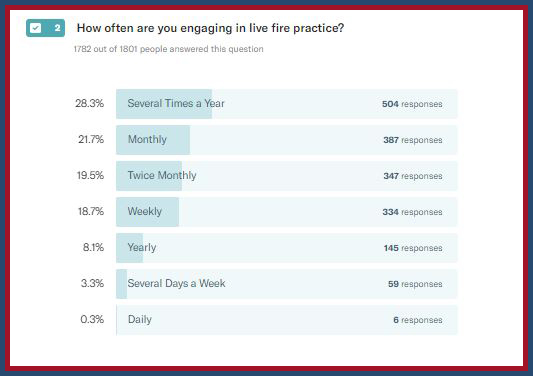 21.7% of you said that you engaged in live fire practice at least monthly. I, personally, fall somewhere between monthly and twice monthly. I'd love to say that because I work for the industry that I get to go shooting every week, or even every day, but that's just not realistic. Not for me, anyway. So, I try to go at least once per month, if not twice. I actually have an excuse to go to the range because I write gun reviews. However, I'll note here that just going to the range and putting lead on paper is NOT really training. That's target practice and while still important, unless you can move and shoot, shoot from behind cover, shoot one handed, drills, etc., that's not really training. It's target practice. Again, still important, I just want to highlight the difference. This next one is an interesting one. Most of us, me included do not participate in a competition. It's something that I've been meaning to do, however, and think that you should put it on your list of things to do, as well. When you consider that you can do things in a competition that you cannot do at your local range while doing “target practice” like drawing from the holster, moving and shooting, etc., it hopefully starts to become clear why you should do it. Not to mention the added stress of going up and competing against others, really getting your adrenaline going, is some of the closest you could ever get to the real life and death scenario where you have to use your gun, without actually having to defend yourself. I wasn't surprised at this next result. In fact, I thought the “outdoor” option would have been a little higher. I despise indoor ranges. They smell funky, always have loud machines running, I'm too close to other people … I choose outdoor, personally for my primary method of shooting. Then, again, I'm inside a building more often than I'm outside of a building. So, I have to know what it's like shooting inside a building. 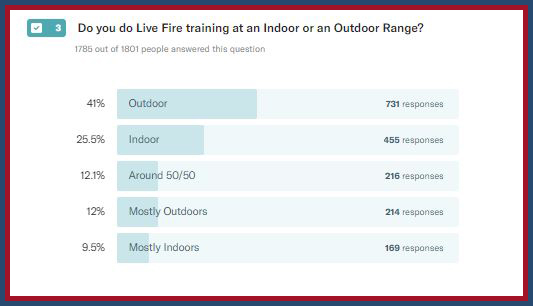 I'm mostly outdoors on this answer, but do occasionally shoot indoors. Which would persuade you to buy/use a timer? This means that, combined with the other price tag category of being under $100, over 900 of us would use a shot timer if they were cheaper. The other responses are also very telling, and while I cannot say much, remember that we're doing something industry shaking. What do you do with a timer? For those of us (earlier) who said we don't see a use for having a shot timer, here ya go. This one is for you. You can measure all these things with a shot timer. As result you get more proficient. 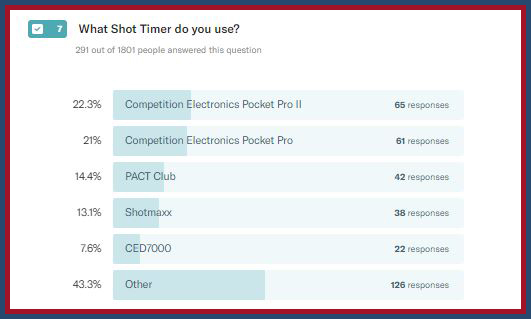 Finally, here is the breakdown of the different shot timers people use in their training. These are the industry standard devices. Okay, so why is all of this important? Well, the cat is out of the bag. We're going to be releasing a brand new shot timer that's going to shake things up a bit. We're still in testing mode and working everything out, but it is coming your way. If you want to stay up to date on the release of this thing, and it's great, please make sure you sign up for our newsletter. We'll let you know once it's released. Also, the survey is still live. So if you want to take part in that, you can do so here. Thank you for the survey results, I just might change my mindset about using a shot stop timer, there is always room for improvement. I don’t understand it when people who shoot once or twice a month say they can’t afford a timer. Skip a couple range trips and spend that ammo money on one. In the long run the timer will be a much bigger help than those two or three shooting sessions. 98% of my time shooting is on an indoor range, hard to use a shot timer with 5 to 11 other shooters popping rounds off.